Rare: cook for 1 minute per side and rest for 8 minutes (on a warm plate). Medium rare: cook for 2 minutes per side and rest for 6 minutes. Medium: 3 minutes per side and rest for 4. Medium well: 4 minutes per side and rest for 2. Well done : 5 minutes per side and no resting. 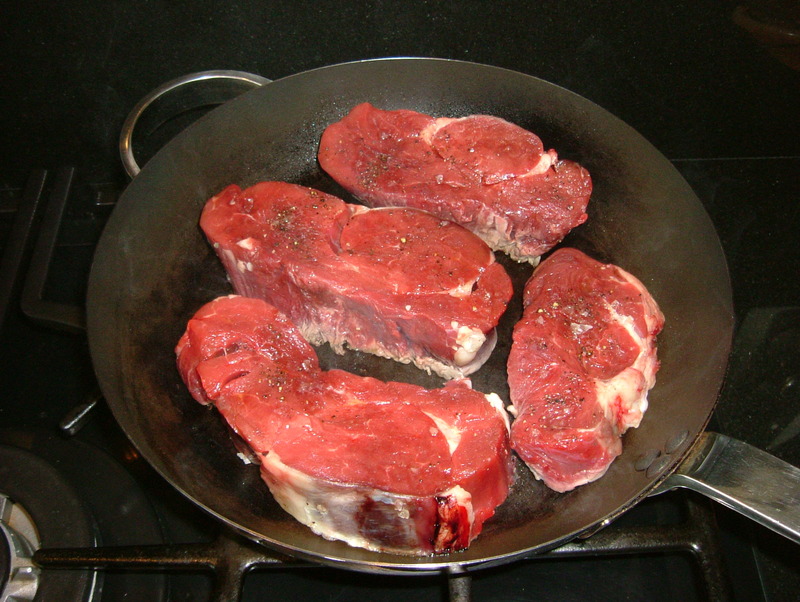 In my house we like our steak nice and charred on the outside whilst tender and pink on the inside and to do this your pan must be very hot – to the point of almost smoking – and you must not put oil in the pan. 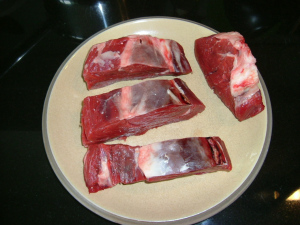 Instead take your steaks out of the fridge approximately half an hour prior to cooking, pat them dry with kitchen paper and then rub oil in to the meat and season on both sides. I am using fillet steak here and they are probably a little under 2″ thick so I will cook for approx. 6 minutes per side for a medium cooked steak. 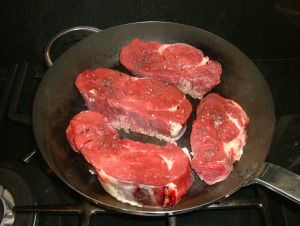 Place the steaks in the dry hot pan and leave to cook for the appropriate time before turning. Don’t be tempted to press them down – you are only squeezing out all of the lovely blood – and don’t overfill the pan – they will only steam. Feel your steak with your finger tips whilst it is cooking and you will soon get an idea of how a steak feels at certain points of ‘doneness’ – the softer and spongier it feels, the rarer it is. When it becomes more and more cooked it will begin to become quite firm and there will be less ‘give’. 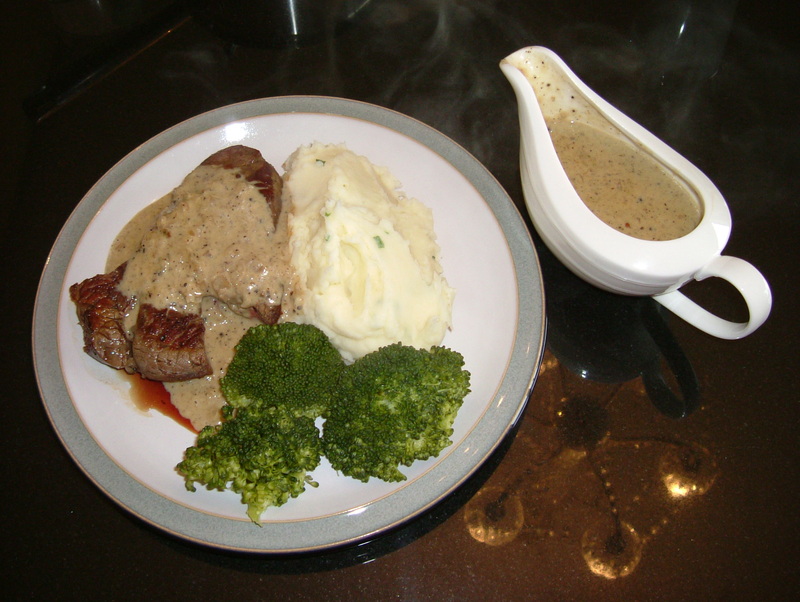 I love pepper sauce with my steak and so long as you aren’t having it every night or drinking by the pint glass it’s not too bad. All in moderation I say. Please note that my measurements are approximate as this sauce is very much my own recipe. Sauté the onion in olive oil over a low heat until very soft. Add the black pepper and continue to cook for a couple of minutes. Add the brandy and flambé or cook out the alcohol. 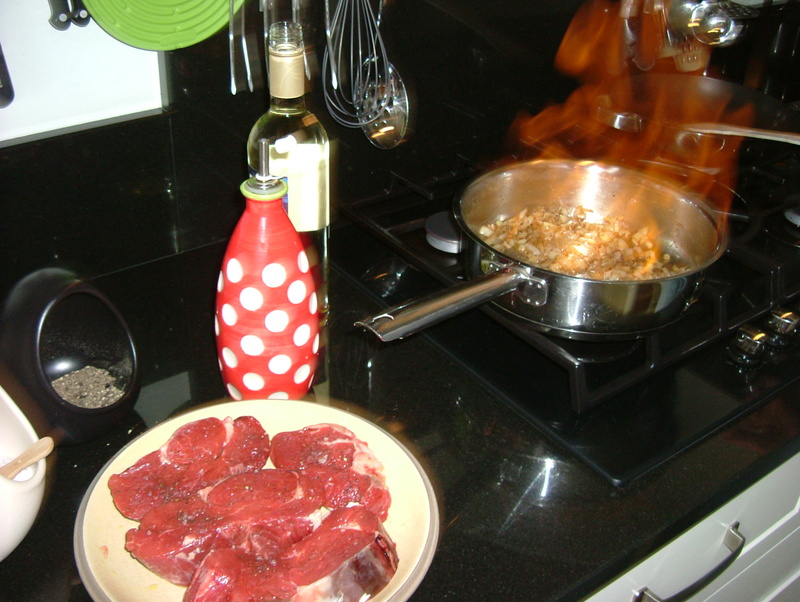 Turn up the heat and add the wine, then simmer until reduced by half. 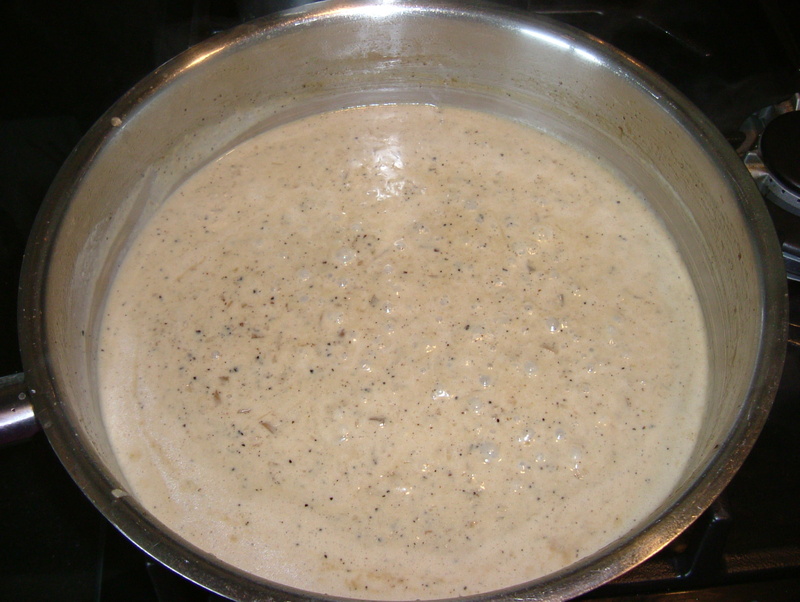 Add the chicken stock, reduce by half and then add the cream and reduce again. Add a good pinch of salt and then blend roughly using a hand blender for a couple of minutes just to thicken but not to make it too smooth. 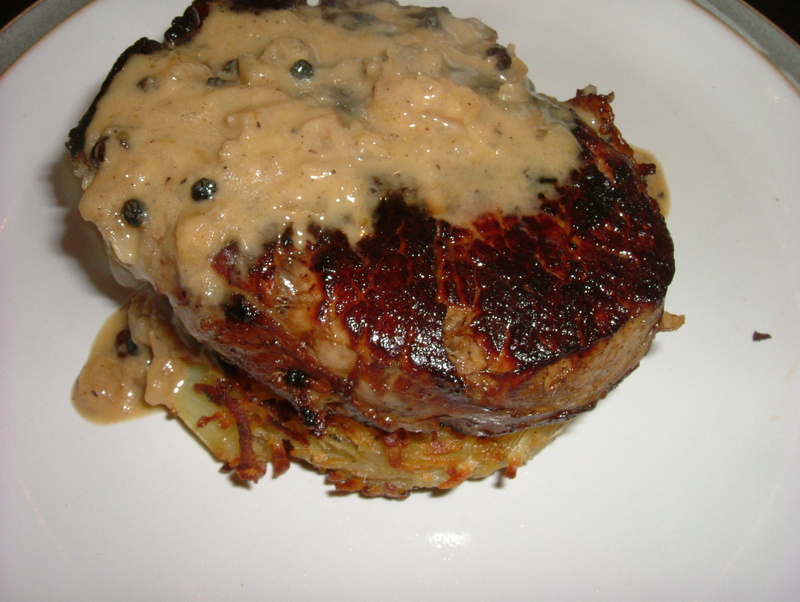 Check seasoning – if you want more pepper add it and cook for a couple more minutes. And then pour on your steak and devour. Tonight we had this with chive mash and broccoli but my favorite way to serve steak and pepper sauce is sitting atop a lovely crispy rosti. The pan used above is from IKEA and in my opinion it is briliant for steaks. Ideally you need a good heavy bottomed non-stick pan and you can spend a lot of money on such items. This was approx. £20 – a bargain! Prawn and Chilli SpaghettiIn "Dinner"
Congrats on the new blog!!! Lovin’ it so far! My mouth was actually watering reading it! 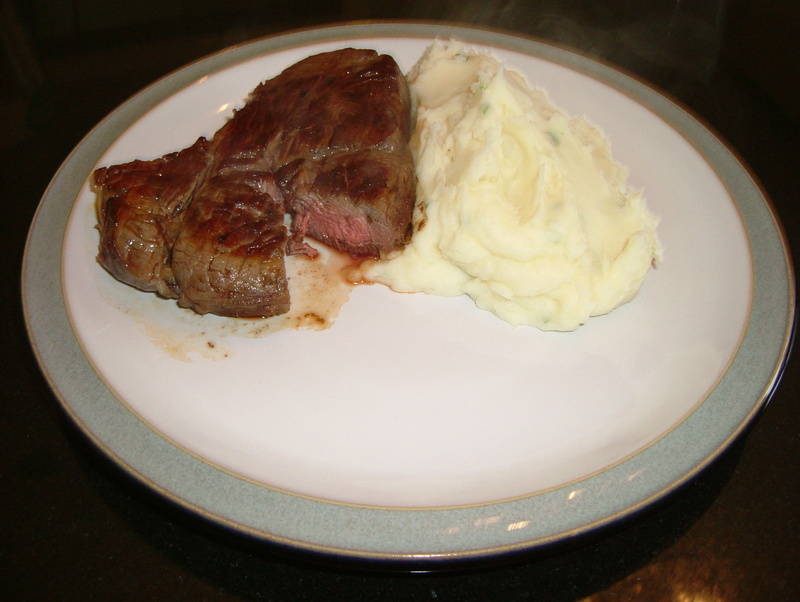 Fab tips – my steak cooking can be very hit and miss, but I’ll be trying it your way next time! Hermione – thanks dear! 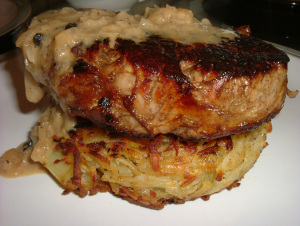 Believe me I have had some major disasters… and usually when I am cooking for guests! All trial and error :) Thanks for the congrats.